There's a new YA imprint, who's debut author has a book coming out next year. 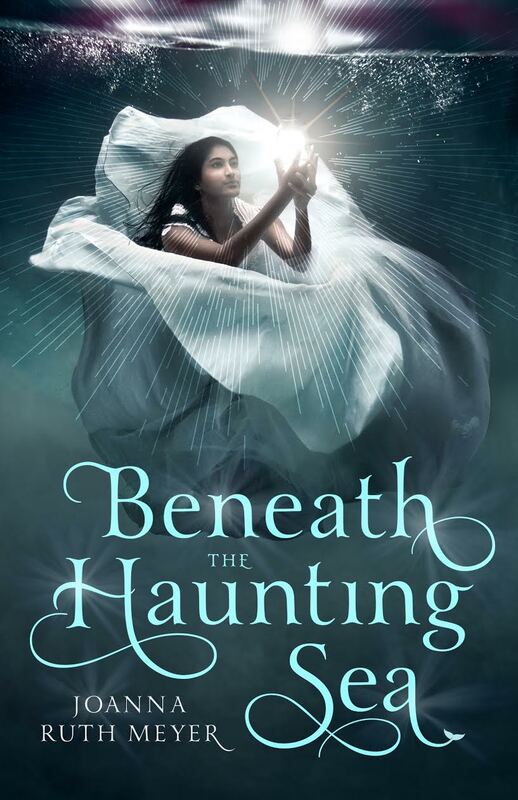 Today I'm thrilled to share both the cover and an excerpt, for BENEATH THE HAUNTING SEA by Joanna Meyer. Ideal for fans of Leigh Bardugo, Sarah J. Maas and Mary Pearson's, this debut will be released in January of 2018. Check out this cover! I love the underwater theme on this cover. Especially the little details, like the mermaid tail on the a in Sea. I'm looking forward to reading this book when it's out. Can’t You Hear It, Talia? Can’t You Hear the Waves Singing? 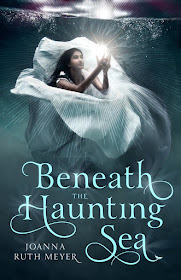 It is here, in the drafty halls of Ruen-Dahr, that Talia discovers family secrets, a melancholy boy who suffers from troubling visions of her future, and a mysterious jar of starlight. On these shores, the eerie melody of the sea is stronger than ever, unearthing long-buried tales of the Goddess Rahn. The more dark truths that she exposes about the gods’ history—and her own—the more the waves call to her, and it may be her destiny to answer. JOANNA RUTH MEYER lives with her dear husband and son in Arizona, where it never rains (or at least not often enough for her!). When she’s not writing, she can be found teaching piano lessons, drinking copious amounts of tea, reading thick books, and dreaming of winter. 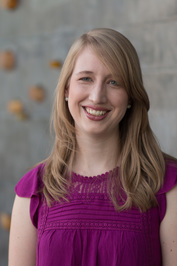 Visit her at joannaruthmeyer.com, and follow her on Twitter @gamwyn. Talia was fast asleep in the cabin belowdecks when the storm came. She started awake to the violent tilting of the floor beneath her and waves slamming against the sides of the ship, so hard she thought it might break apart. She climbed out of bed to look through the porthole, but the ship jerked her backwards and sideways, throwing her in a heap against her mother’s bunk. Somehow, her mother slept on. She couldn’t help but think of her mother’s gods, and the stories she used to tell about them: Tuer of the mountain and Raiva of the trees. Mahl and Ahdairon, Lord and Lady of the air. Uerc of the beasts and Huen of the earth. Caida of the stars and Hald of the rivers. Aigir of the sea. Watching the storm through the porthole, she could almost believe the stories were true. She was struck by her own helplessness, caught in the middle of the vast ocean at the mercy of the waves, or maybe even the gods. Another flash of lightning, another crrrrrrraaaack of thunder. A wave hit the ship so hard it tipped sideways, throwing Talia against the door. Her bare foot caught on something sharp and she hissed in pain. The next moment she was tossed back towards the porthole. She touched it with one hand, and the icy coldness of the glass shot through her. She scrambled back towards the glass, fighting the roll of the vessel, desperate for another glimpse of the whale. Just as she reached the porthole lightning flashed again, but there was nothing out there anymore. The creature had vanished from sight like the sea had swallowed it whole. Like it had never existed at all. “Here.” She grabbed her mother’s hand in the dark, alarmed at the terror in her voice. Talia wrestled to her feet, scrabbling in her pocket for a packet of matches. She lit the lamp on the ceiling. Orange light spun through the cabin, illuminating her mother writhing on the floor with tears streaking down her cheeks. Her right wrist was bent almost entirely backwards against her arm. She counted to twelve and Hanid was back, lugging a large leather box with him. He pressed it into her arms. “Gods keep you!” he cried, then turned back to help his men. “She’ll kill us all!” gasped her mother, over and over. Sweat and tears poured down her face. “What is that?” Talia demanded, kneeling on the floor beside him. But Talia knew better. Her mother was stronger than the Emperor and obdurate as a mountain. A mere fever would never incapacitate her like this. And her mother sighed and shut her eyes. She fell into a fitful sleep, twisting in the bunk, sweat glistening on her forehead. The day slipped slowly away, and her mother slid in and out of fretful dreams, writhing in the sheets, mumbling and crying in her sleep. Talia sat with her, holding her hand and wiping the sweat from her forehead. She pleaded with the gods she didn’t believe in: You took my father from me. You can’t have my mother, too. Hanid came to see her in the midafternoon, carrying a battered tea tray. He set it on the floor under the porthole, and Talia’s mouth watered at the scent of roasted pork, even though she didn’t feel particularly hungry. Hanid grabbed a bottle from off the tea tray—more opium—and uncorked it. Her mother rustled uneasily in the tiny bunk, and Hanid tipped a few drops of the drug into her mouth. She swallowed automatically, and lay quieter. “I wish you wouldn’t do that,” said Talia, eyeing the bottle with distaste. “She’s not seasick,” Talia objected. And then he bowed and left the cabin. Talia hugged her knees to her chest and screwed her eyes shut. You took my father from me. You can’t have my mother, too. The waves slapped against the side of the ship, and for a moment she thought she heard a thread of music curling out of the sea. I love the cover, is beautiful. The excerpt sounds great too. thank you for sharing it and putting it on my radar. Eee, this cover is gorgeous :D Sounds like an amazing book too. <3 Thank you for sharing about it sweetie :) Curious about this one.